Really excited to see Thor: The Dark World this weekend but not as excited as my wife is. If you are anything like her, you can't help but to ogle and drool at the very sight of Chris Hemsworth aka Thor and Meg is no different. Oh and don't be afraid to comment below on who you'd like to see show up in the next edition of The Paper Series. Great job, but, Thor make me thinking about Chris Evan, no ? Nicely drawn! I love it. "They said human women only live for a flash of our life. But damn I'm going to hit it like an angry god.... well, I am." What female WOULDN'T ogle at Thor? co to ma być do cholery!?!?!? Could you do one with Commander shepard? her smile is perfect somehow, it brings a weird kind of attractiveness to her that i cant really explain, nice work! Yes I can admit to that. with thor the dark world out, this is jsut eprfect! Best part is that she kinda looks like Jane. Love these! She kind of does look like Jane. Thanks for the kind words. You're welcome. Keep up the great work. For us in Scandinavia Thor look just like viking riding a carriage whit two goats. 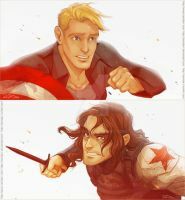 But its funny that they have become superheroes...well more epic superhero style. And they only ate raw meat.